This enchanting 24-page illustrated book and CD includes 11 stories and accompanying songs to inspire parents and teachers when they are outdoors with their children or students. Click the button below to purchase the book and CD for $25 + $4.99 S&H via Paypal. My children and I listen to Wendolyn’s CD in the car daily and everyone (ages 3-12 years, plus me) loves to hear the stories! My 3-year-old especially enjoys the songs and has learned to follow along with the stories. They are just the right length for her attention. The wonderful way nature is woven into the fabric of the stories excites all the senses and imagination. 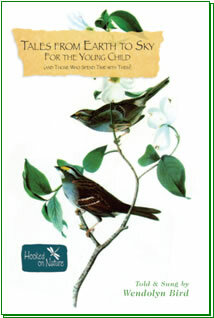 Wendolyn Bird’s Tender Tracks CD is a treasure for anyone who has young children and wants them to fall in love with nature. Her stories are alive and charming, her voice is beautiful.